The island of Milos is connected to Athens and Piraeus with regular ferries and fast catamarans. The ferry schedules are quite frequent (especially during the summer period) and the ferry tickets are usually quite cheap for regular ferries and a bit more expensive for the catamarans. Milos is directly connected to most of the islands of western Cyclades, as Ios, Sifnos, Serifos, and Kimolos. Most of the ferries leave from the port of Adamas. However, there are is also a frequent ferry connection from Milos to Kimolos, through Pollonia port. The duration of the trip is 30 mins and it is a perfect destination to have a one-day excursion. Milos is also connected to Heraklion, Crete during the summer. Finally, the fast ferry SeaJet 2 connects Milos to Santorini, Folegandros, Anafi, and Amorgos, allowing easy island-hopping among the Cyclades. I have visited Milos during the summer of 2016 with my friends and not with my significant other. We took the ferry from Piraeus and arrived in the port of Adamas in 5 hours. We stayed in Adamas in some nice rooms and every day we took our breakfast in Plaka (it's quite close to Adamas), the beautiful village of Milos. We had also hired a car to explore the beauties of the island. And our first stop was at Klima, a nice fishing village with multi-colored houses built into the unique natural caves. In the basement of the houses, there were installations to facilitate fishermen' boat from sea and weather. Milos has over 75 beautiful beaches, with crystal clear water, astonishing rocks, and white-golden sand. The most interesting beach, super crowded though, is Sarakiniko. 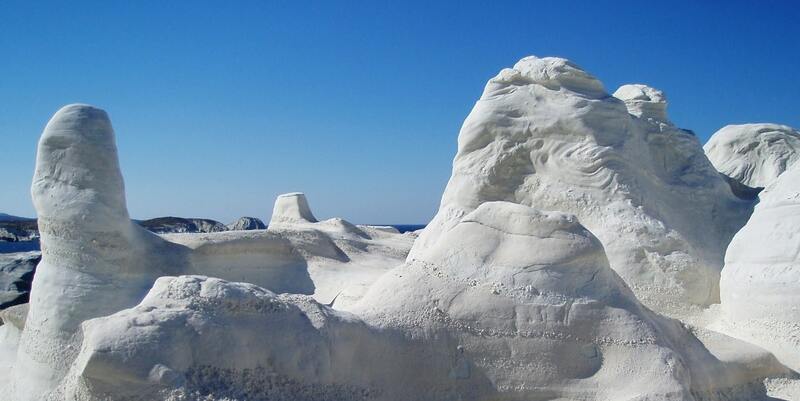 The white rocks with the weird shapes transfer you to an extraordinary lunar landscape. If you are looking for an off-the-beaten-track beach, then you should visit Triades, three beaches on the western side of the island. The road is not so good, but this allows you to keep some privacy in these distant beaches.